When it comes to corporate apparel, no one has Branding Pros beat! Promotional products are just one way Branding Pros can help you market your business. At Branding Pros, we recognize the importance of recognition. From a single Yard Sign to a complete Trade Show Booth, we can help. At Branding Pros, we make customer service our number one priority. 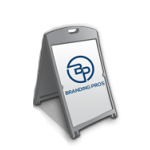 The beauty of Branding Pros is its ability to offer everything you need to promote your business–all in one convenient location. One-stop shopping—decorated apparel, give-aways, banners, awards—all the makings of a successful event or a successful marketing plan is right in your own backyard. Branding Pros has it all. Take a look at what we have to offer. We know you’ll agree that we have what it takes to be an extension of your marketing department and your resource for everything promotional. We are located in the Poughkeepsie Plaza!